Several weeks ago, I offered my readers the chance to win 2 free downloads of my collection of poems, “The Writer’s Pen and Other Poems” on audible.co.uk. I am now offering you the chance to win 2 free downloads of “The Writer’s Pen” on audible.com. You can find “The Writer’s Pen” here, https://www.audible.com/pd/B07KPN5FCH. 1. Anyone who has an account on audible.com (or who is able to use audible.com) can enter. 2. The winners will receive a code enabling him/her to download a free copy of my book from audible.com. Please note, the code will only work on audible.com. 3. In order to enter the competition, please email the answer to the question posed at the end of this post to me at newauthoronline (at) gmail dot com. (The address is rendered thus to defeat spammers). Please put “Competition to win an audio download of The Writer’s Pen in the subject line of your email. 4. The competition will close at 6 pm on Saturday 22 December (UK time). 5. Any entries received after 6 pm on Saturday 22 December 2018 will not be considered. Which 19th-century author wrote the novel in which Long John Silver and his parrot appear? 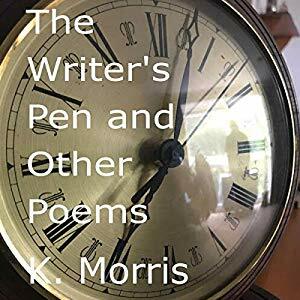 This entry was posted in books, creative writing, literature, newauthoronline, poems, poetry, uncategorised and tagged audible.com, competition, free audio download, k morris poet, newauthoronline, the writer’s pen and other poems on December 15, 2018 by K Morris Poet.